87 Marlborough is located on the north side of Marlborough, between Berkeley and Clarendon, with 85 Marlborough to the east and 89 Marlborough to the west. 87 Marlborough was built ca. 1864 for shipping merchant and real estate investor John Lowell Gardner, one of nine contiguous houses (71-73-75-77-79-81-83-85-87 Marlborough) he had built as rental property. He and his wife, Catharine Elizabeth (Peabody) Gardner, lived at 7 Beacon and then at 182 Beacon. 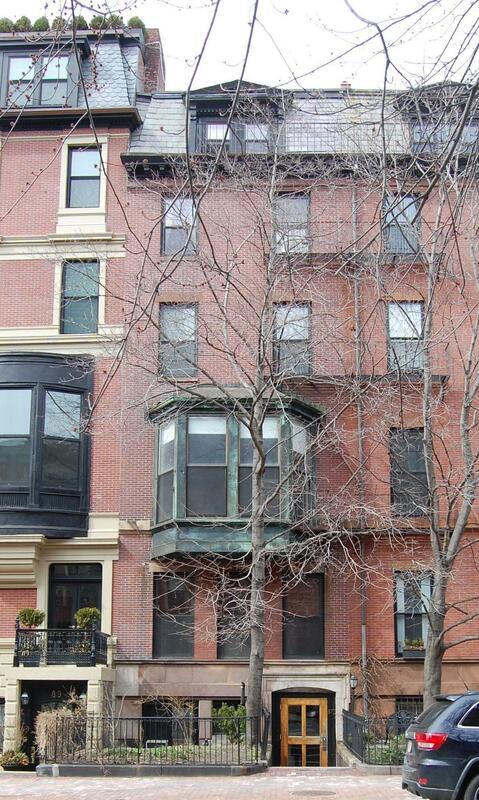 Click here for an index to the deeds for 87 Marlborough. By 1865, 87 Marlborough was the home of hide and leather dealer Josiah Fiske Guild and his wife, Lucy Walker (Bradshaw) Guild. They had lived at 21 Somerset in 1864. 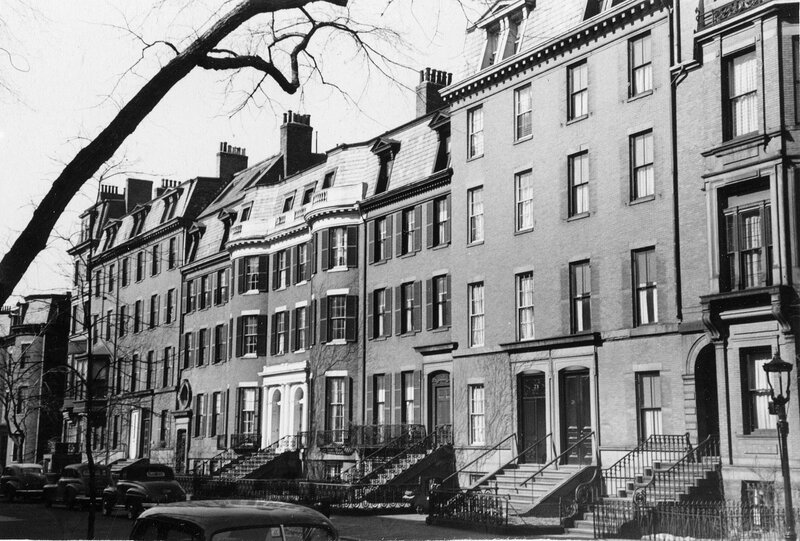 They continued to live at 87 Marlborough until about 1870, but were living at 5 Tremont Place by 1871. By 1871, 87 Marlborough was the home of insurance broker Isaac Frank Dobson and his wife, Ellen (Atkins) Dobson. They continued to live there in 1875, but had moved to 75 Marlborough by 1876. 87 Marlborough was not listed in the 1876 and 1877 Blue Books. By the 1877-1878 winter season, 87 Marlborough was the home of wholesale dry goods merchant Thomas Motley and his wife Eleanor (Warren) Motley. They previously had lived with his parents, Edward and Ellen (Rodman) Motley, at 22 Commonwealth. They continued to live at 87 Marlborough in 1894, but by 1895 had moved back to 22 Commonwealth to live with his mother, who had been widowed in January of 1894. 87 Marlborough was not listed in the 1895 and 1896 Blue Books. By the 1896-1897 winter season, it was the home of architect Joseph Randolph Coolidge, Jr., and his wife, Mary Hamilton (Hill) Coolidge. Joseph Coolidge was the grandson of John Lowell Gardner, the son of Joseph and Julia (Gardner) Coolidge who lived at 147 Beacon (303 Berkeley). 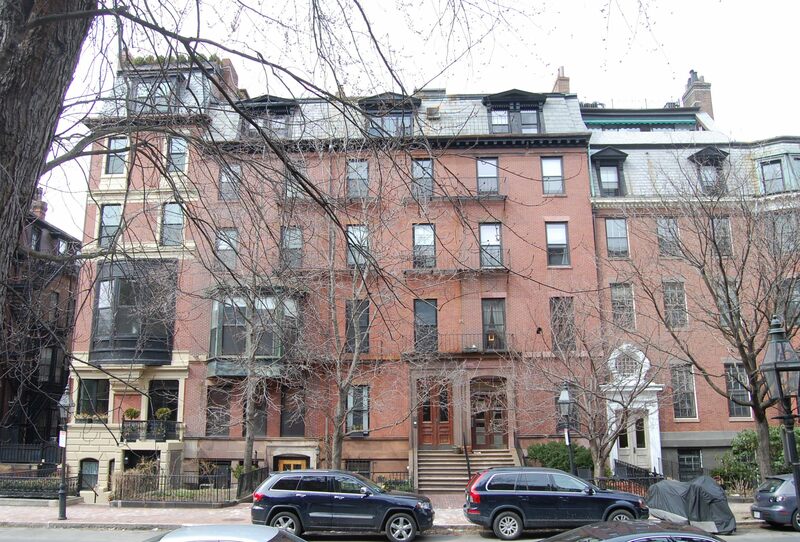 Joseph and Mary Coolidge continued to live at 87 Marlborough in 1904, when they moved to the Longwood district of Brookline. By the 1904-1905 winter season, 87 Marlborough was the home of architect Walter Thacher Winslow, a widower. He previously had lived in an apartment at 330 Dartmouth. 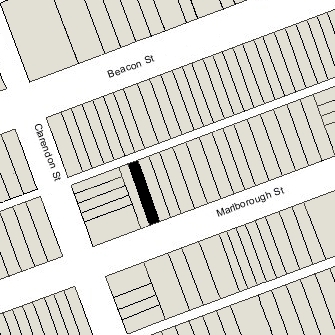 He continued to live at 87 Marlborough in 1907, but had moved to 146 Marlborough by 1908. On February 26, 1907, 87 Marlborough was purchased from Joseph Peabody Gardner, Jr., William Amory Gardner, and Augustus P. Gardner by Dr. Hugh Cabot. He and his wife, Mary Anderson (Boit) Cabot, made it their home. They previously had lived 5 Marlborough. Hugh Cabot was a surgeon and urologist, in practice with his cousin, Dr. Arthur Tracy Cabot, who lived at 3 Marlborough. They maintained their practice at 1 Marlborough (owned by Dr. Arthur Cabot). In 1911, Dr. Cabot was named Chief of the Massachusetts General Hospital’s newly-established Genito-Urinary Outpatient Service. In 1916, he joined the Royal Army Medical Corps and served from 1917 to 1919 as commanding officer of the No. 22 General Hospital of the British Expeditionary Forces. Mary Cabot and their children continued to live at 87 Marlborough. In 1919, the Cabots moved to Ann Arbor, Michigan, where he became Dean and Chief Surgeon at the University of Michigan’s Medical School. 87 Marlborough was not listed in the 1920 and 1921 Blue Books. On September 12, 1921, 87 Marlborough was purchased from Hugh Cabot by Margaret (Higginson) Barney, the wife of Dr. James Dellinger Barney. They previously had lived at 112 Marlborough. J. Dellinger Barney was a urologist and had been a member of the Genito-Urinary Outpatient Service headed by Hugh Cabot since it was formed in 1911. He served as Acting Chief of the Service while Dr. Cabot was in France during World War I. In 1920, after Dr. Cabot moved to Ann Arbor, Dr. Barney replaced him as permanent Chief of the Service. The Barneys also maintained a home in Ipswich (until about 1934) and then in Dublin, New Hampshire. Margaret Barney died in 1938; James Barney continued to live and maintain his medical office at 87 Marlborough until about 1940. By 1941, he had moved his office to 374 Marlborough and was living in Cambridge. 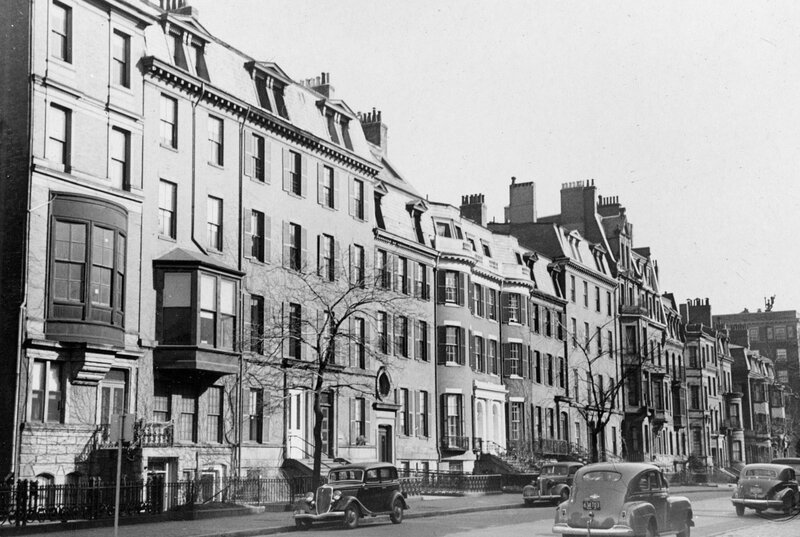 On February 1, 1941, the Provident Institution for Savings in the Town of Boston foreclosed on its mortgage to Margaret Barney and took possession of 87 Marlborough. In 1941, the house was shown as vacant in the City Directory. On June 6, 1941, 87 Marlborough was acquired from the Provident Institution for Savings by Dr. Roger John Abizaid, an osteopathic physician, and his wife, Nella (Wallen) Abizaid. They lived in Roslindale. In February of 1942, he applied for (and subsequently received) permission to convert the property from a single-family dwelling into a lodging house. By the mid-1940s, he also maintained his office at 87 Marlborough. Roger Abizaid died in February of 1973. On May 15, 1973, 87 Marlborough was acquired from Nella Abizaid by real estate broker and investor Patrick J. Glynn. 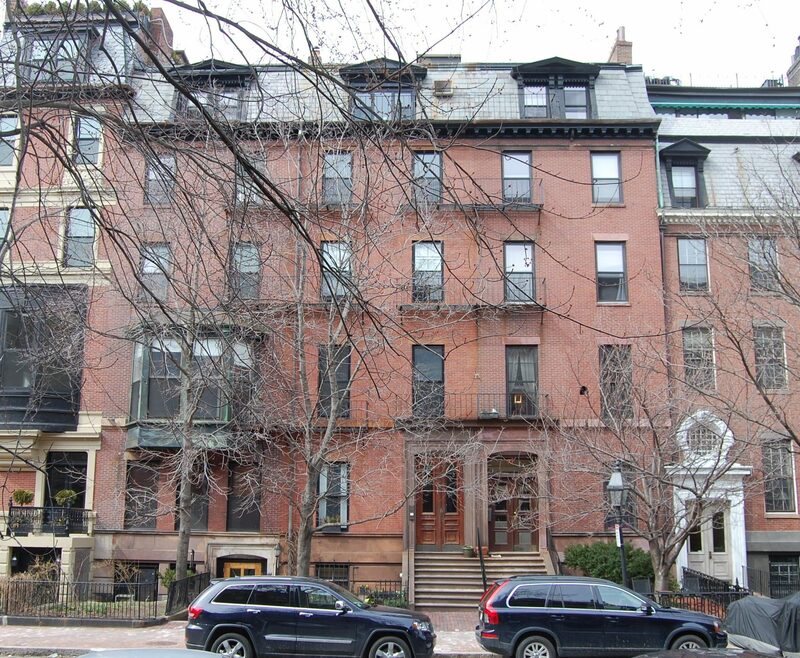 On January 22, 1991, he transferred the property to himself and his wife, Anne T. Glynn, as trustees of the 87 Marlborough Street Realty Trust, and on On December 31, 1996, they transferred the property to the Glynn Realty Associates IV, LLC. 87 Marlborough remained a lodging house in 2015.